After a great few weeks of beta testing, I am ready to roll out the latest version of Talon for Twitter, to everyone! Talon 6 overhauls all of the pieces of the app you use most. Everything from profiles and tweets, to the image and article viewer got a revamp. The app is faster, everything is sleeker, everything is easier to use, and everything looks way better. Plus, this version comes with a ton of new features and functionality. Your Twitter experience has never been better. I am so happy to get it into everyone's hands! 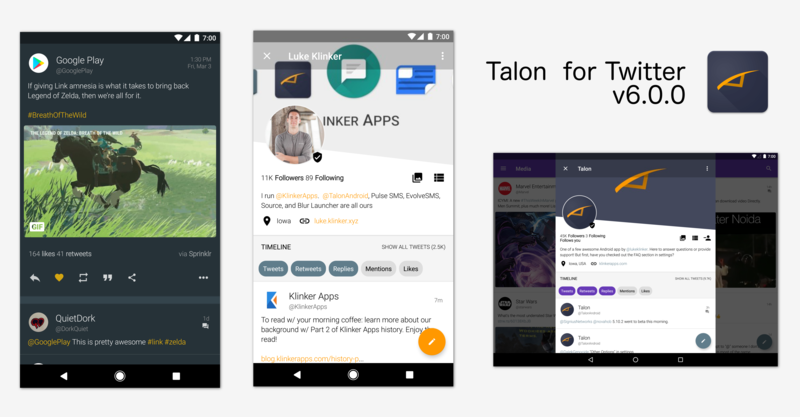 I have been working on this update for quite awhile and it is the biggest update to Talon in the past year. Twitter Moments links will always open to the Twitter webpage, since they don't make these available to third party apps. Enjoy the update 'all, try it out and let me know what you think! I do have one major thing that I will be open-sourcing, from this version. If you are a developer, look out for that shortly!